The Washington Post food editor Joe Yonan has turned a Vegetarian. So here is a recipe dedicated to Joe and to all my vegetarian friends. This is a very simple recipe which can be made quickly and easily. 2. Cut green pepper, onions and whole tomatoes into 1" squares. Alternatively you can substitute whole grape tomato or cherry tomato instead of cutting whole tomatoes. 3. In a medium size mixing bowl, make a marinade with all the ingredients from lemon juice to salt. 4. Soak the cut cubes of Paneer, pepper,onions and tomatoes in the marinade for about half an hour. 4. Soak bamboo skewers in water for a few minutes. Then, thread the cubes of paneer, onions, tomatoes and green pepper on to bamboo skewer. 6. Serve with chutney of your choice. * Hung yogurt - Plain yogurt which is hung in a muslin cloth so as to remove some excess whey from the yogurt. Alternatively some sour cream can be incorporated to the plain yogurt to make it thick. * "Paneer"- is home made cheese. It is readily available in Indian grocery stores. How to make Paneer at home will be a future post. * Amchur Powder - available in Indian grocery stores - Usually made from dried unripe green mangoes. See what we are serving for the Superbowl 2012 at Indique. This savory beverage is wonderfully refreshing. Cut the curry leaves into fine shreds. Toast the cumin seeds in a dry skillet until fragrant. Let cool and crush to a coarse powder in a spice grinder. Cut the ginger into fine shreds. Coarsely chop the chili, if using. Combine the curry leaves, cumin, ginger, chili (if using), yogurt and water in a blender and mix well. Blend in salt to taste. Serve with ice cubes. For a milder-flavored drink, lightly crush the curry leaves, ginger and green chili, stir them into the yogurt and water along with the crushed cumin, and refrigerate. Strain out the solids and season with salt before serving over ice. If you do not want your drink to be spicy hot, omit the green chili. All of the co-hosts did a cooking demonstration. Carla demonstrated how to make a fried apple pancake ring. Carla's sister, mother and husaband Mathew were among the audience cheering Carla. On behalf of all the Washingtonians and the Chefs/Restaurateurs, we would like to wish Carla and her co-hosts all the very best! Here are some pictures of the show, along with a recipe for Pizza Margherita demonstrated by chef Mario Batali. Here is a recipe for Pizza Margherita as demonstrated by chef Mario Batali on Chew. Chef Mario Batali demonstrating making of pizza..
We were expecting some guests at home. My wife Nisha and my mom had made all the dishes for the evening. Most of the dishes were Vegetarian, so I decided to supplement the Menu by making a quick preparation of a Kerala style Cornish hen/chicken curry. It was a challenge to cook and handle the camera at the same time ! I will look forward to your comments. Happy cooking! 1. Remove the skin, cut into small pieces, rinse, dry with a paper towel and set aside in a mixing bowl. 2. Set aside the whole spices like small cardamom, black cardamom, cumin seeds, cloves, bay leaves, star anise, cinnamon on a small plate. 3. On another plate set asdie ground spices - red chili powder, coriander powder, turmeric powder. 4. Chop onions( preferably red onions). 5. Add the ground spices like red chili powder, turmeric and coriander powder on to a skillet and warm them up for a minute or two with a few drops of oil, making sure not burn the spices. 6. Add the warmed up spices on to the cornish hen/chicken along with the plain yogurt, and a few sprig of curry leaves. Mix well and set aside in the refrigerator for about an hour. 8. Now add the marinated cornish hen/chicken and continue to stir for a few minutes. Cover and cook on a slow fire, occasionally stirring till the cornish hen/chicken is done. Note : if you like gravy in this dish, you can add some water. My personal preference is to cook without any water. Thanks to my dear friend Sala Kannan, Vegetarian / Vegan food blogger and food photographer, for featuring me as a guest on her amazing blog - www.Veggiebelly.com.Sala's readers asked a lot of questions about Dosa/Idli and I tried to answer the questions to the best of my ability and at times when it got too technical/scientific; I used the help of a very dear friend Dr. Danny Chawan, who is a food scientist, based in Buffalo, New York. Above : Masala Dosa with coconut chutney and Sambar. Above : Mini Tadka Idli - tempered with mustard seeds, urad dal, turmeric, curry leaves and whole red chili. In the picture above, an oothapam being served with assorted chutneys. We also serve a version topped with ground chicken at Indique and Indique Heights. Benjamin Franklin, who wasn't in favor of the bald eagle being the official symbol of the United States, much preferred the turkey, which he called a "respectable bird, and withal a true original native of America." Historians aren't sure whether that's why the tom headlines on most Thanksgiving tables, but one thing's certain: Part of the reason you're serving a Butterball or heritage American Bronze is due to the fowl's versatility. "Turkey is a blank slate, ready to receive any flavor imprints. The meat is mild and the breast is porous, so it absorbs seasonings well. If you brine it, the salty, spicy liquid can permeate all the way to the bone," says Grace Parisi, senior recipe developer at Food & Wine magazine. So, if you want to send your turkey on a round-the-world taste trip, check out these relatively simple recipes from three top D.C. chefs. Like duck, turkey stands up well to strong, spicy flavors — which might be why many Southern tables let good times roll with a turducken — a Cajun combination of a chicken stuffed in a duck stuffed in a turkey. Scott Drewno, executive chef atWolfgang Puck's Asian fusion temple, The Source (575 Pennsylvania Ave. NW; 202-637-6100), takes that idea a bit further afield, using Chinese spices to lacquer the whole bird. "No matter how you decide to cook your turkey for Thanksgiving, brine it," he says. "That ensures you get a terrific taste." Combine all brine ingredients in a large pot. Bring to a boil. Remove from heat and allow the brine to come to room temperature. Add turkey to the brine, cover and leave overnight in the refrigerator. Remove turkey from brine and pat dry. Pre-heat oven to 450 F.
Season generously inside and out with Szechuan pepper and sea salt. Optional: Stuff it with Chinese sausage fried rice you make or take-out. Place turkey in roasting pan and roast for 20 minutes. Brush skin with peanut oil and lower heat to 350 F. Cover turkey loosely with foil and roast until internal temp reaches 160 F. Remove from the oven and let it rest for 20 minutes before carving. Pour Szechuan sauce over the top before serving. Warm the chili oil and sesame oil in a large saucepan over medium-low heat. Add the chopped garlic and chopped shallots. Cook for a couple of minutes, just to soften the garlic and shallots but not to brown them. Add the soy sauce, ground Szechuan pepper, sambal, palm sugar, sweet paprika, wine and chicken stock. Simmer uncovered until it thickens to your desired consistency—but watch out for the spicy fumes! Try ginger-glazed yams, Szechuan-style green beans and to sip, a pinot noir. You won't find turkey curry on menus in India. But K.N. Vinod, co-owner of Indique Heights (2 Wisconsin Circle, Chevy Chase; 301-656-4822) tasted it there in 1980. "I was working at a hotel in South India. A group of homesick Americans was staying there during Thanksgiving," he recalls. "I found a Christian priest, who sold me a turkey and surprised them with a traditional Thanksgiving dinner." Vinod says turkey has a great affinity for Indian spices; so do his kitchen cohorts S.B. Bala Murugan (right) and Edwin Dass (left), who helped him with this recipe. In a large bowl, combine the turkey, onion, ginger, garlic, cumin, cilantro, garam masala, salt and red chile paste. Divide the mixture into 20 balls; place them on a lightly oiled baking sheet and flatten into patties. Bake at 350 F for 12 to 15 minutes, until cooked through. Serve with mixed vegetables, rice pilaf with dried fruits and nuts and cranberry chutney. To sip? Masala chai. Haidar Karoum, executive chef of Proof (775 G St. NW; 202-737-7663) andEstadio (1520 14th St. NW; 202-319-1404), has never met a gobbler when visiting Spain. But he thinks gobbler breast makes a good base for bold Spanish flavors such as garlic, smoked paprika and sherry. "When I think about turkey on Thanksgiving, it is not just about the bird but also the combination of the meat with gravy, stuffing, cranberries and yams," he says. Heat 2 tablespoons olive oil in a large skillet over medium-high heat. While the oil is heating, slice 1 1/2 pounds boneless, skinless turkey breast into 1/4-inch slices. Season with kosher salt and gently lay them in the hot pan. Work in batches if your skillet won't hold all the slices in a single layer. Flip the turkey slices once they start to brown on the bottom, about two minutes. Cook for two minutes more on the other side. Transfer to a platter and keep warm. Add another 2 tablespoons of oil to the same skillet and lower the heat to medium. Add the diced bell peppers, diced onion and garlic cloves, and cook, stirring, for a minute. Add the chopped olives and the pimenton, and cook for a minute more. Stir in the sherry and parsley, and cook just until it bubbles. The vegetables should remain a bit crisp. Spoon the pepper mixture over the turkey slices and serve. Sauteed Catalan-style spinach (with raisins, pine nuts, onion and apple), and roasted young potatoes with sliced leeks and chorizo. To drink? A light Spanish red such as a Garnacha. Score a fowl that's scratched and gobbled nearby at these local markets. Most of these places require pre-ordering your turkey. Many of the market locations — inclu-ding Foggy Bottom, Crystal City and Bethesda — host local farmers who will be selling turkeys. You can pick up whole birds, half-birds or just breasts. This Rocky Ridge, Md., outfit offers free-range pastured birds. Go toGroffscontentfarm.com for more details on local farmers markets that'll be selling the birds. This Fulton, Md., farm sells frozen turkeys throughout the year and fresh turkeys for Thanksgiving. It has a large selection of fowl products, including whole turkeys, turkey sausages and smoked turkeys. Localharvest.org/organic-farms can help you find other gobbler-centric local farms in the D.C area. Almost every other restaurant in town serves a Creme brûlée on its menu, which essentially consists of egg yoks, cream, and sugar. 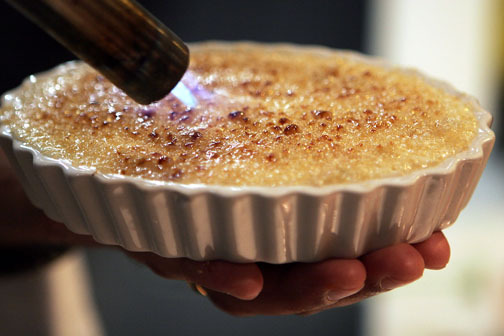 At Indique Heights in Chevy Chase, MD, we have been serving a much healthier version called shreekandh brûlée, which is made of low fat yogurt, sugar, cardamom, saffron and nuts. I have been getting constant requests for this recipe. So as promised here is the recipe... Make this during the holiday season. Happy Holidays! Cardamom powder, a pinch of saffron, chopped pistachio and almonds. 3. Mix well. Divide it into about four portions and spread evenly on to a crème brûlée dish / ramekin. 4. Sprinkle with raw brown sugar evenly on top of each of these dishes and with a blow torch evenly caramelize the sugar and get a golden brown crust. Keep the flame to a medium high and rotate the dish evenly. P.S: I personally prefer to grind whole cardamom in a spice grinder. (a coffee grinder kept exclusively for spices). I throw in whole pods of cardamom with the skin and grind to a fine powder. You can add mango puree or diced mango and make it into a mango shreekandh, omit the cardamom, add some orange rinds and a few drops of any orange liqueur and serve it as an orange shreekandh; go a step further and serve it in an orange shell. There are no hard and fast rules, so go ahead and use your imagination and have fun. I look forward to hearing from you about your innovations and ideas. Banana Tree (though technically not a tree) is one of the most versatile plants that I can think of. Every part of a banana tree is utilized in one way or the other. It is one of the most eco friendly, biodegradable and sustainable plant. 1. The shoot which grows from underground and becomes the trunk of the tree. 4. Bananas - I am sure each of you have your favorites. 5.Banana leaves - As a medium of wrapping and steaming or baking. Here in the Washington DC metropolitan area banana flowers are available in Indian grocery stores, Korean Markets, and other Asian bazaars. 1. Wash and rinse the banana flower in cold running water. Detach the first one or two layers of the banana flower (banana boat) and set aside for presenting the prepared dish in it. 2. Chop the banana flower as shown in the picture. 3. Heat oil, add mustard seeds and curry leaves. When the mustard seeds begin to crackle, add whole red chilly, chopped garlic and ginger. When the garlic and ginger starts getting a golden color, add chopped onions and saute till the onions are translucent and slightly golden in color. 5. Dish on to the banana flower boat and serve hot. * Grated coconut : Available in most Indian grocery stores ( frozen) , if you do not want to use fresh. VARIATION : You can cook some green peas along wit it. Have fun going bananas ! trunk, fruit or the flower ? Your Choice ! Bon Appetit ! I am delighted that my Lemon Chili pickle recipe was featured in "Cooking for one - A Craving for condiments" The article was written by Joe Yonan of the Washington Post. I hope you enjoy these photographs as much as I have enjoyed taking them. The spicier counterpart to Moroccan preserved lemons, this pickle can be made in just a day and used immediately, unlike some traditional recipes that call for a 30-day-or-longer curing period. Nonetheless, it will deepen in flavor as it ages. Use it on rice, as a table accompaniment to grilled or roasted meats, or even mixed with cream cheese on a bagel or in a sandwich. The recipe calls for asafetida, an oniony spice that is available at Indian markets, where the curry leaves and dried sanaam chili peppers also can be found. MAKE AHEAD: The lemons need to marinate for 1 or 2 days. The pickle can be refrigerated in an airtight container for up to 6 months. Wash and dry the lemons. Cut each one in half lengthwise, then cut each half into 16 equal pieces. Place in a medium bowl and add the salt and vinegar. Cover; marinate at room temperature for 1 or 2 days, stirring occasionally. Heat the oil in a medium saucepan over medium heat. Add the mustard seeds; once they start to crackle, add the dried chili peppers, asafetida, curry leaves and fenugreek seeds, stirring to combine, then add the marinated lemon pieces and their marinating liquid along with the chili powder, garlic powder, turmeric and ginger. Mix well and bring to a boil; cook for a few minutes, then reduce the heat to medium-low and cook for 10 to 12 minutes or until the lemon pieces start to become tender. Cool completely in the saucepan, then transfer to an airtight container and refrigerate for up to 6 months. Adapted from K.N. Vinod, chef-restaurateur of Indique, Indique Heights and Bombay Bistro. Tested by Joe Yonan for The Washington Post.